Wedding Vows are delightful ways to express your personal wishes for your partner and your married life. Many Brides and Grooms make personal vows to each other in their wedding ceremony. Sometimes these personal vows are individual for the Bride and Groom, and sometimes they are ‘shared’. By far the most popular personal vows are those written individually for the Bride and the Groom. Quite often the words in the vows are kept ‘secret’ from the other party until the wedding day! Yes, I will help you to write your personal wedding vows! Presentation is important, especially on your wedding day! 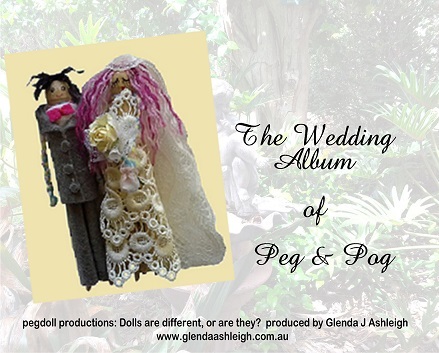 As Brisbane’s Really Good Celebrant, I attend to the details that make all the difference. I match the colours for the vow booklet graphics and decorations with your chosen wedding colours. Contact me for delightful personal wedding vow booklets for your wedding ceremony! 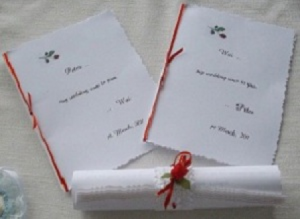 Wishes and words for personal wedding vows come from the heart. They express your personal hopes, dreams and values for your marriage. Choose the words that you and your partner understand and appreciate. Your personal wedding vows are your words. Have fun with your vows! Use words that you like and that you understand. The only rule to follow is: “Vows are respectful.” Apply this rule to everyone involved in your wedding ceremony and your guests. Think about the people who will hear you say your vows and ask yourself this question, “Do I want them to hear this?” Keep the more intimate expressions for private conversations with your partner! So you want to write your personal vows? Make a start! Write notes about all sorts of ideas, collect examples of vows and write something that you feel is ‘right for you’. Jot down a few points about what you bring to the marriage and what you wish for married life, then write your personal vow. Need inspiration? Here are some suggested links to wedding vows sites to help you get started. More modern vows. Quirky vows. How to write your personalised vow.